One of the most common home additions is a bathroom addition. Adding a bathroom off of a guest room, home theater, or other space that you find yourself in often is an excellent idea to save time and increase the worth of your home. 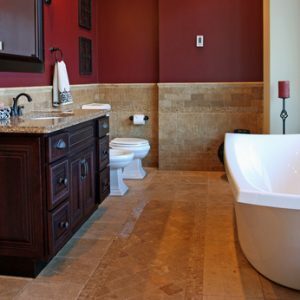 Whether you are looking for a simple, small half-bathroom or a full luxury bathroom, Reliant Construction can build it. The first step to a bathroom addition is deciding what kind of bathroom you want. Full bathrooms off of or near guest rooms are guaranteed to add the most value to the home, and 3/4 bathrooms (with a shower stall but no tub,) can be fit into smaller spaces and are less expensive while still adding functionality to your home. Adding a half bath with only a sink and toilet to spaces such as a sunroom or game room adds extra convenience for family members and guests alike.